Updated: 2007-07-10 09:42 The Temple of the Moon has undergone a major facelift and reopened to the public two months ago with its original grandeur restored. Tourists can enjoy visiting four major imperial temples in Beijing - the temples venerating the heaven, the earth, the sun and the moon - where emperors worshipped nature on various sacred days. The four temples were built in locations demarking the four cardinal directions, forming a square that surrounds and protects the Forbidden City. They are now public parks. The Temple of the Moon has undergone a major facelift and reopened to the public two months ago with its original grandeur restored. Tourists can enjoy visiting four major imperial temples in Beijing - the temples venerating the heaven, the earth, the sun and the moon - where emperors worshipped nature on various sacred days. Built in 1530, the roughly 8-hectare Temple of Moon, or Yuetan Park, to the west of the imperial city was the site of imperial sacrifices to the moon. In the past decades, bushes and fruit trees have been planted here. In 1969, a 180-meter-tall television-broadcasting tower was erected in the park, taking up about one-eighth of its total space, according to Wang Jun, an official with the Xicheng District Gardening Bureau. During the restoration project, many damaged parts were rebuilt, including the walls of the altar, the square white marble sacrificial platform, the sacrificial routes through the park and many ancient dwellings. The Beijing municipal government and the Xicheng District government jointly earmarked 190 million yuan ($23 million) for the renovation project, which also called for relocating the broadcasting tower and upgrading the park's environment. Four institutes and 178 households near the altar are also being relocated to make way for the altar wall and expanded greenery. Location: 6 Yuetan Beijie, Xicheng District. Buses to get there: 15, 19, 823. The Temple of Earth, or Ditan Park, near the North Second Ring Road, is where emperors prayed to the earth for favorable weather and national prosperity. 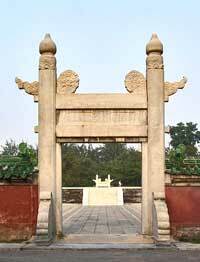 Built during the Ming Dynasty in 1530, it is the only existing place to worship the earth. According to ancient Chinese belief, heaven is round, while earth is square. So, the Temple of Earth's construction included many square altars and walls. This magnificent temple consists of five main buildings arranged on the north-south axis, with annexed halls flanking both sides. 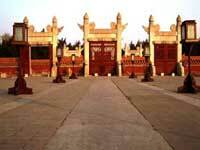 The Chinese government has listed the temple among the most important historical monuments under special preservation. The surrounding areas have become an open space for people to engage in leisurely activities. Since the late 1980s, traditional temple fairs have been held here regularly during the Chinese lunar new year. Location: A2 Di'anmenwai, Chaoyang District. Buses to get there: 13, 27, 104, 108, 116, or take the subway to get off at Yonghegong to go north. 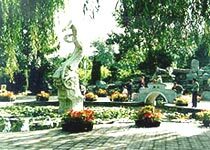 The Temple of Sun, or Ritan Park, in eastern Beijing, is located near the Jianguomen area and adjacent embassy district. It is a short walk from the Yong'anli subway station on the Line 1. The altar was built in 1530 as a place for emperors to make ritual sacrifices to the sun. The park has been undergoing slow but steady renovation and upgrading since it opened to the public 50 years ago. It features expansive gardens and a small lake. A mural wall, the park's main scenic attraction now, was a piece of artwork created about 20 years ago to draw more sightseers. The tiled mural depicts sacrificial ceremonies for the sun in emulation of what was done on these grounds by Ming and Qing emperors. The park is also known for its blossoming lotuses. Location: 6 Ritan Beilu, Chaoyang District. Buses to get there: 1, 4, 28, 43, 57, 120.